Several of the nation’s largest retailers, including Target, Macy’s and J.C. Penney, will be open for business on Thurs. Nov. 25, but our annual Thanksgiving survey finds that Affluent Americans prefer pumpkin pies to parking lots, cranberry sauce to crowds, and mashed potatoes to markdowns. 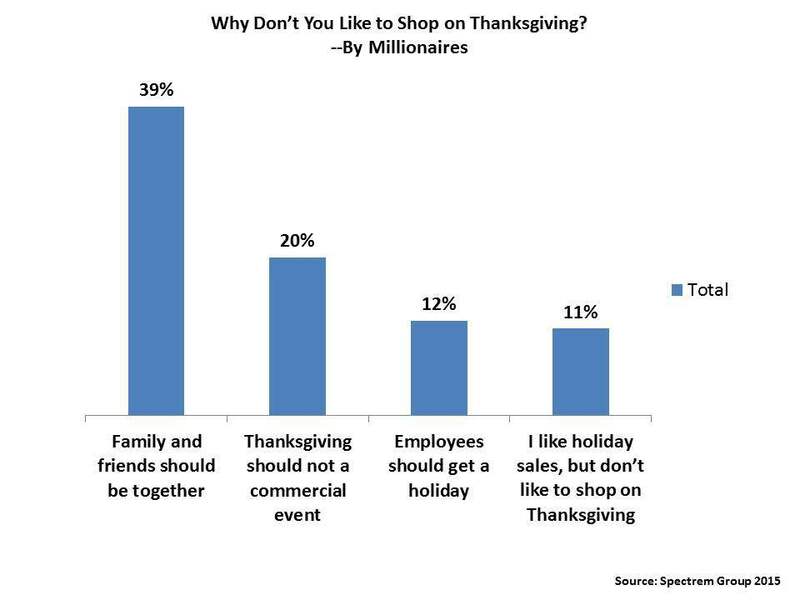 Nine-in-ten Affluent adults surveyed indicate they will not be shopping on Thanksgiving. The reason? Nearly four-in-ten said that family and friends should be together on Thanksgiving rather than in stores, while 20 percent said they do not like to see the holiday turned into a commercial event. Twelve percent take the altruistic view that employees shouldn’t have to work on Thanksgiving, while 11 percent said they like holiday sales, just not Thanksgiving shopping. As the winter holiday shopping season officially kicks off this month, who does or does not shop is of primary importance to retailers and the economy. The fourth quarter has accounted for at least 40 percent of annual sales in each of the last three fiscal years. This year, the National Retail Federation projects that 136 million shoppers will hit the stores or shop online during the Thanksgiving, Black Friday, Small Business Saturday and Sunday stretch. Sales in November and December are projected to increase 3.7 percent over the same period last year, generating $650.5 million. Online sales are forecast to increase 6 percent to 8 percent in November and December to as much as $105 billion. But on Thanksgiving, Affluent individuals we surveyed are mostly going to give shopping a rest. Some though, will be venturing out. Analysis by net worth and age finds less wealthy and younger Affluent respondents are most likely tear themselves away from the Thanksgiving table to hit the malls. Respondents with less than $100,000 are slightly more likely than their wealthier counterparts to take advantage of Thanksgiving store hours (17 percent, vs. 6 percent of those with between $500,000-$1 million and $1 million-$5 million each, and 9 percent of Ultra High Net Worth households with at least $5 million net worth). Younger Affluent respondents, too, are more likely than older respondents to shop on Thanksgiving (roughly 20 percent of the under 40 crowd and those ages 41-50 compared with 10 percent of Baby Boomers ages 51-60 and 4 percent of those ages 61 and up). Why shop on Thanksgiving? Simple; they enjoy it, according to 21 percent of Affluent respondents. Twenty percent do not love it, but that are compelled to take advantage of holiday deals. Sixteen percent reported that shopping on Thanksgiving has become its own holiday family tradition, while 13 percent said they wanted to complete their shopping early or only went because someone else wanted them to go along. The prospect of Thanksgiving holiday shopping gets a mixed reception from respondents who identify themselves as fiscally liberal or fiscally conservative. Of those who do shop on Thanksgiving, conservatives are three times as likely as liberals to overcome their disdain for Thanksgiving shopping to pursue the deals they want (31 percent vs. 10 percent), while liberals are most on a quest to complete their holiday shopping early (20 percent vs. 14 percent). Fiscal liberals, too, take a more liberal view of shopping on Thanksgiving: They like it (30 percent) more than their fiscally conservative counterparts (23 percent). As to those who respect the sanctity of Thanksgiving, fiscal liberals and fiscal conservatives are in near equal agreement that the holiday is more a time for family and friends and that they don’t like to see the holiday turned into a commercial event.